Enteric coating and orange flavor means no nasty taste or fishy burps! 100% Nordic fish means no worries about ingesting potentially harmful contaminants. Concentrated formula helps you get your daily dose in fewer capsules. Great value. Each bottle is good for 30-60 servings. Added antioxidants help Oximega stay fresher, longer after it’s been opened. Who Should Take Controlled Labs Oximega Fish Oil? Men and women who want to ensure the fish oil they take is fresh and pure. Anyone who wants to get their daily dose from a couple of softgels. Guys and girls that hate the nasty, fishy taste of most other supplements. Anyone that wants a natural supplement to help them stay lean, strong, and healthy. Fish oil supplements like Controlled Labs Oximega can be of benefit to almost everyone. Whether you are a fitness fanatic, pro athlete, or just looking to feel healthier and more energetic, it can help. Studies show fish oil supplements have several benefits that range from improving the health of your heart, decreasing joint pain, and weight loss. Unfortunately, there are a few things that keep many of us from taking a fish oil supplement. The two most common are it’s nasty aftertaste and the fact that you don’t know whether your supplement contains fish oil that’s fresh and free of impurities. Oximega eliminates both of these problems. Since it’s enterically coated and orange flavored you’ll never have to worry about getting a fishy aftertaste or an upset stomach. Freshness and purity aren’t a problem either. Every capsule of Oximega contains fish oil that’s tested and guaranteed to be pure and free of contaminants. Added to every serving is vitamin E which helps it stay fresh longer. Last but not least, Oximega is a concentrated source of fish oil. This means that you you get over 1 gram of EPA and DHA, the fatty acids that give fish oil its benefits in every 2 capsule serving. Other fish oil supplements in the same price range require you to take 2-3 times as many caps to get the same dose. This makes it super convenient to take, even if you take more than 1 gram of fish oil every day. 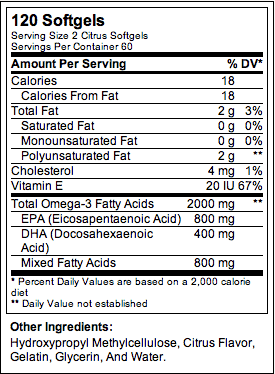 Directions For Orange OxiMega Fish Oil: Take 2 softgels once or twice per day with meals. Consume with at least 6 ounces of water. Take this product daily for overall health. Consume at least 1 gallon of water per day. Warnings: You should not take this product if you have any prior medical condition, including diabetes or high blood pressure, or are not in top physical condition. Do not take this product if you are on ANY prescription drugs without consulting your doctor first. Please consult your doctor before using this product. Keep Out Of Reach Of Children. Be the first to review “Controlled Labs Oximega – 120 Softgels” Click here to cancel reply.